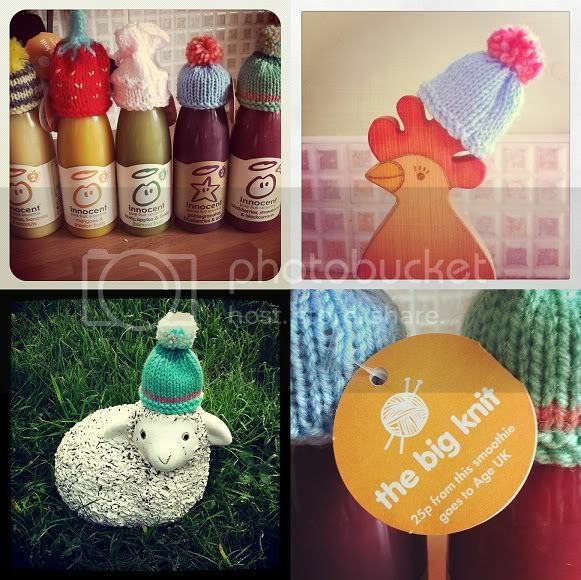 a few weeks ago, i was contacted my innocent smoothies, who asked me to take part in their big knit campaign. for those of you who aren't aware of it, it involves innocent smoothie bottles being adorned by the cutest little knitted hats. they sit over the bottle top and look amazing. for each bottle sold with a knitted hat on top, innocent smoothies donate money to ageUK. ageUK is a fantastic charity, which helps the elderly through tough times. i know how much i would appreciate their help if anything was to ever happen to my amazing nan, so i was more than happy to help promote this cause. they sent me a pack of smoothies, each with their own hats, and asked me to take some comical photos using said hats. i jumped at this, as i love both innocent smoothies, and hats. i enjoyed putting them on top of pretty much everything animal-related in my house/garden. i particularly like the little sheep, rocking his green hat like a dude. i'm going to head over to their facebook page, and post these photos there. for every photo posted, they're going to donate 10p to ageUK. so make sure to look out for these smoothie bottles with the little hats, and please try and spare some money to buy one! you'd get a yummy smoothie, a warm charitable heart, and a hat to put on your pet (or small human) of choice. HOw charming! As far as I'm aware there isn't anything like that happening here in Australia... hmm if only I could knit.. Such a good idea. Super cute knitted hats. cuteeeeeee pics!!! !gotta check that site!wooop! aww, how cute! C: i really have to go and look for these tomorrow. hoping that sweden is participating in this campaign as well!